Do You Snore? There Is A Dental Connection! Obstructive Sleep Apnea (OSA) is a life-threatening condition that affects over 18 million Americans. This commonly undiagnosed syndrome involves the cessation of breathing during sleep. While sleeping, the upper airway muscles enter relaxation and may vibrate against each other (this vibration is what causes snoring). As sleep deepens, muscle relaxation increases and can occlude the airway. This severely decreases the amount of oxygen flowing to the lungs. The body responds to this lack of oxygen by sending a signal to your brain that you are suffocating. The brain compensates by lightening the phase of sleep in order to increase control and contraction of upper airway muscles, ultimately increasing oxygen flow to the lungs. This constant exchange between suffocation and arousal can occur several times throughout the night and many do not recall it happening upon fully awakening the next morning. Health professionals use the Mallampati Classification system to determine your risk of OSA: Patients with Class I and Class II Mallampati scores have lower risks of OSA since their airways are mostly patent (open). Patients who are in the Class III and IV range are at a much higher risk of OSA due to the obstruction of their soft palate. As you hopefully know by now, we are here to support your total health – we are invested in you as our patient! If you notice any of these symptoms for yourself or your loved ones, please make an appointment for a consultation. We will work with your physician to help with diagnosis and evaluation of treatment options. I May Have Sleep Apnea – What Should I Do? One of the first steps in diagnosing OSA is performing a sleep study. From the study, if OSA is diagnosed, there are several routes of treatment depending on a few specifics including the severity. The three common treatment options include a continuous positive airway pressure (CPAP), oral appliance therapy (OAT), and surgery. CPAP Therapy is the most common treatment method for OSA. It involves wearing a face mask that connects to a machine via plastic tubing. The machine forces oxygen through the mask at a continuous rate, predetermined by your doctor, throughout the night. This was the gold standard for treatment of OSA until recently as it is highly effective in maintaining oxygen intake during sleep. However, its efficacy is often diminished by the lack of patient compliance. Patients often find that it is not comfortable and only wear it for an average of three hours per night. Surgical Options often involve soft tissue and/or jaw surgery to increase airway opening. While these surgeries have varying degrees of success, nonsurgical options are typically recommended prior to proceeding with this route. OSA is a life-threatening condition that is grossly undiagnosed in the United States. 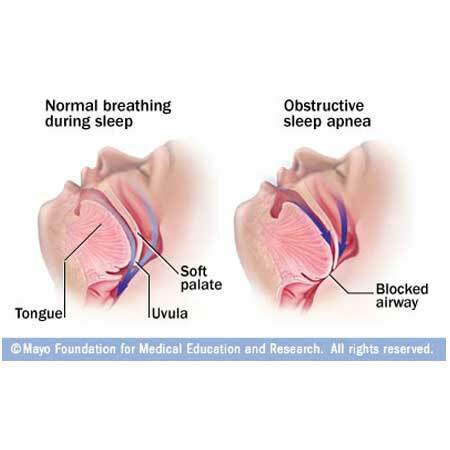 Treatment options for OSA include: CPAP, OAT, and surgery. While CPAP has been deemed the “gold standard” for OSA treatment, its effectiveness is compromised by patient intolerance and unwillingness to wear it. Patients who have tried CPAP and (1) did not have good results or (2) were not able to tolerate it should consider trying OAT. If you or someone you know may have OSA, contact us today! 1Dental Sleep Solutions. “What is OSA Syndrome?” 2014. Web. 21 Feb. 2017. 2Ramar, K. “Clinical Practice Guideline for the Treatment of Obstructive Sleep Apnea and Snoring with Oral Appliance Therapy: An Update for 2015.” AASM. American Academy of Sleep Medicine, 2015. Web. 21 Feb. 2017. For Heart Healthy Month, Get To The Dentist????? YES! Why Read Reviews? Because We Love To Hear From You! Wednesday 8:00 a.m. – 5:30 p.m.